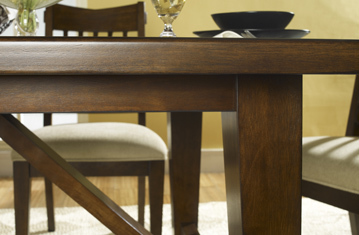 Savor everything on quality crafted dining room furniture. 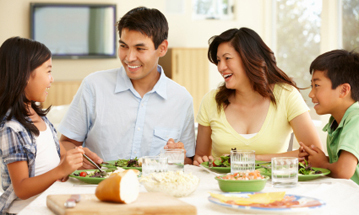 FAMILIES WHO BREAK BREAD TOGETHER BUILD RELATIONSHIPS THAT SPAN GENERATIONS. 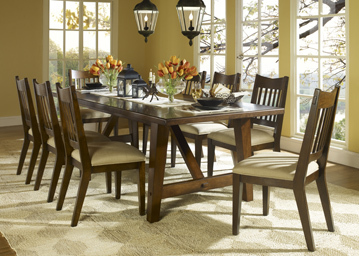 Samson International is committed to providing you with dining room furniture perfect for any occasion or gathering. You can probably remember sitting around the table during the holidays with relatives and friends sharing special dishes "just like Grandma used to make." The beauty and versatility of our designs make every day a celebration. Isn’t it comforting to know that one day she’ll be helping your grandchild with their homework at the same table? We have a wide selection of dining room furniture including tables, chairs and buffets artfully crafted with solid hardwood and hand-selected veneers for longevity and durability. Sit down with company in your home and enjoy making memories for years to come.